Type #1 have cast bronze grated covers for applications other than for children's playgrounds. Type #2 have solid, 1/2" ( 12mm) Poly Carbonate Plastic covers, sand blasted for no slip surface, but with clear windows above light fixtures, which can ave special liquid cooling for lamps above 50W. 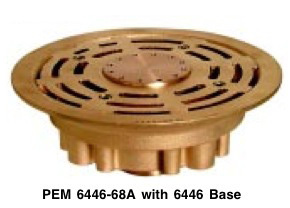 PEM M 900 STANDARD ASSEMBLIES are available with cast bronze, solid or grated covers or poly. carbonate covers for insertion into 10" (250mm) PVC pipe sleeves Pipe sleeves to be deep enough to store assembly, flex. hose and cables. PEM M 910 & 920 HEAVY DUTY ASSEMBLIES are available with cast bronze, solid or grated covers or poly. carbonate covers for insertion into 12" (300mm) PVC pipe sleeves. Remote, from top accessible, pipe disconnects and caged assembly for public applications requiring extra maintenance consideration. Pipe sleeves to be deep enough to store assembly, flex. hose and cables. PEM M 900 SPRAY APRON MODULES are offered with 4 types of spray nozzles to be activated by PEM W 114 Water Switch for computer controlled multiple spray & color effects. PEM M 906 & 920 SPRAY APRON MODULES are supplied with dual PEM 932 Jets, directional adjustable from above after installation. The dual jets are connected to either outlet of the PEM W 114 Water switch and can be oscillated etc. PEM M 915 SPRAY APRON MODULES with PEM 938 , 50mm / 2" Foam Jet with 4 Lights and optional with W 115 Water Switch for a illuminated extreme heavy spray effects, available with bronze or poly carbonate cover for 12" (300mm) pipe sleeve. PEM M900 SPRAY APRON MODULES require a maximum waterlevel of appr.100mm below grating except 915 Modules that require appr. 400mm 16" of free board. For suggested connection to supply pipe use 1" ( 25mm) coiled flexible hose in suitable length to permit lifting up of unit for relamping. Electrical connections are suggested to use a suitable PEM Submersible Junction Box with PEM Cord Seals in bottom of sleeve, connected by a suitable PEM Cordseal to a suitable flexible supply cable, long enough to permit connections being made above ground level. 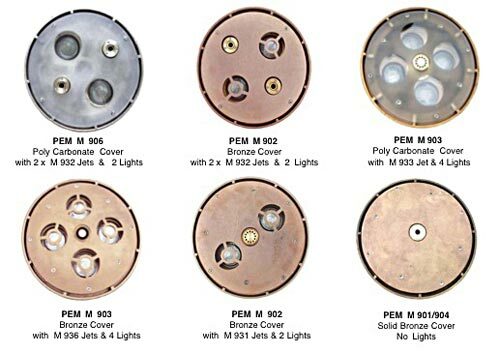 PEM M 900 SPRAY APRON MODULE ILLUMINATION is by PEM E 40 Light Fixtures. 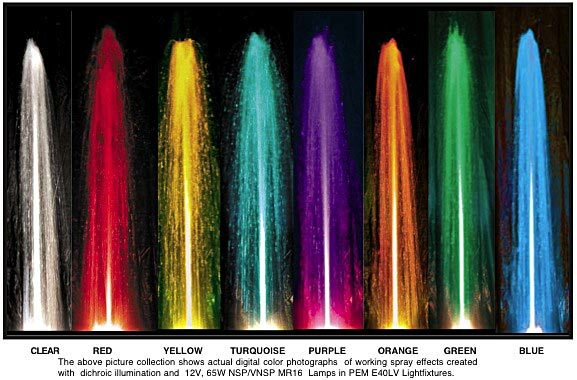 For colored illumination or color changing illumination, high intensity dichroic color lenses are available as an option to the light fixtures to produce outstanding color renditions of the spray effects illuminated. Always advise factory if lamps with higher wattage than 50 Watts are to be used in PEM E 40 under poly. carbonate covers. As you can see, there are many configurations for the PEM M900 Spray Aprons. You can peruse the products below, but to really get the best experience out of the PEM M900 Spray Aprons, you should contact Coastal directly for assistance.